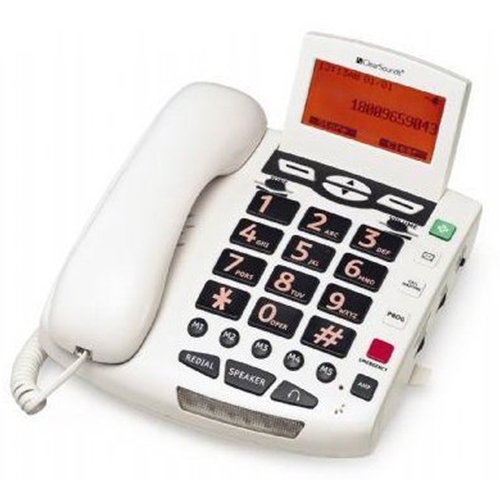 ClearSounds CSC600 Amplified Big Button Phone with Caller ID and Speakerphone from HealthyKin.com combines superb design, ergonomics and functionality with the most powerful amplification and tone management technology available. It delivers power without devouring it. The handset offers adjustable amplification up to 50 dB and full range tone controls. The base system is amplified and the ringer can be adjusted up to 95 dB, so you won't miss a call. While the phone delivers this robust set of powerful features, it's designed to consume 50% less power than other amplified phones. What else does it offer? Outgoing speech amplification, a large backlit angle-adjustable LCD, 99 name/number Caller ID history, display dial, missed call and voicemail waiting indicators, and more. Clearly, to understand why UltraClear is a top seller, you'll want to examine the long list of features below. Note: Use of Caller ID requires subscription to Caller ID service.